Questions and Answers-nurseries, moving, toddler beds, military family life, sleep, and more! 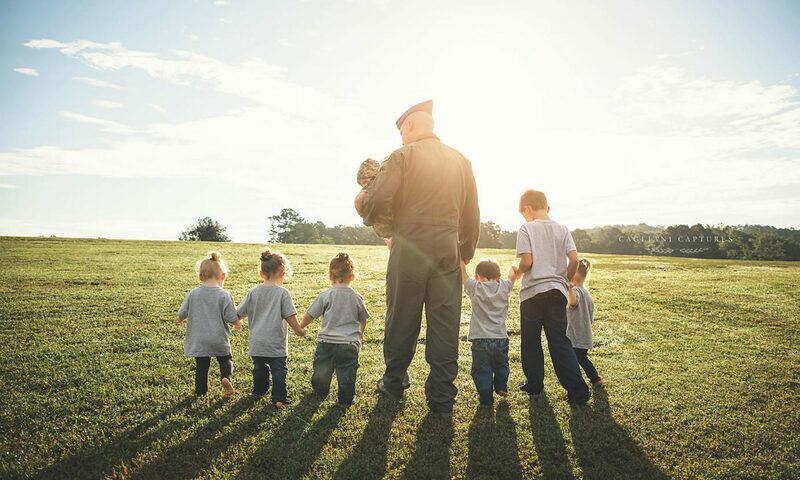 “What do the kids nurseries look like?”, “You moved 3 times in 2 years?”, “How did you switch them to toddler beds…my one child won’t stay in one?”, “How big is your house?” “What is it like being a military family?”. These are a few of the questions we have received recently. I figure answering as many of the different questions we get in one swoop would be easier for everybody! Here is a picture of our base house in New Jersey. When we first found out about the quints, we knew it would be tight fitting us all into a 3 bedroom (1400 sq ft) house but we were determined to make it work. Military spouses, friends, and coworkers were amazing to us when they heard the news. Michael and I were both still in the military at this time. We would often head to work and come home to a surprise blessing of hand-me-downs and other items for the quints on our front porch. We had been at this base for roughly 5 years so knew a lot of people. I would wash, clean, and organize things as soon as I came home. It was exhausting growing 5 humans, working, taking care of Conner, but I knew it had to get done. With no basement, we literally had organized bins stuck in every nook and cranny. We were scheduled to move to Northern Alaska in a couple of months at this time. However, after hearing about the quints. The military cancelled those orders. We had 4 bassinets for our room (5 would not fit). We bought all of our own car seats and strollers to carry them in new though. I am really picky that car seats and mattresses have to be new for safety reasons. Babies R Us forgot to mention they had a multiples discount though. I wish we knew back then but hey we’ve gotten wiser since :). I did use coupons though. We turned our dining room into a nursery. 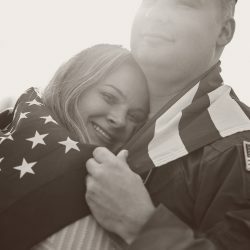 At 20 weeks, I stopped working as an EMT in the Air Force and looked for a new specialist due to almost losing all of the babies. That led us scrambling on what to do and head to Dr. John Elliott in Arizona. He is a world renowned, higher order multiples expert. I packed up and flew to Arizona at 21 weeks. This was scary since we had never been there but knew we had to try everything to give our babies the best outcome. Michael escorted me there but had to return to NJ immediately for work and Conner. Our plan was for him to come out hopefully before I delivered for a few days and return to NJ. I would stay in AZ until they could all safely travel by air ambulance back to NJ. However, at the last moment we received orders to move to Arizona. So, I rented this house from the hospital bed during my 10 weeks of hospital bed rest. Our first AZ house! It was really spacious on the inside and about 2600 sq feet. Michael and our stuff arrived 2 days before the quints were born! Our sudden move made us be way over weight for our weight allowance based on an E5 rank. Michael tried to balance the first week in AZ by: unloading the moving truck, setting up/unpacking necessities, being at the delivery, being at the NICU, finishing his last online college classes to obtain his degree, and settling into work at his new unit/base. I spent 5 days in the hospital post c-section and then headed home to unpack, heal, and back to the NICU. Conner’s nursery was very elaborate and done in a Winnie the Pooh theme. Anything that is Winnie the Pooh for the quints is a hand-me-down from Conner. It is sweet to look over and have so many memories. When you first walked into the house, there was a giant room that was suppose to be a formal dining and formal living room. With 5 preemie babies coming home, we did not need a formal anything! Hence, you got the Mecca of all baby rooms! Bouncers, cradles, bassinets, car seats, strollers, and nursing pillows filled the space. Michael returned to working 40+ hours a week, and a few TDY’s (temporary duty work trips) 10 days after they were born. We knew very limited amounts of people in the area and at that time no family lived close. We were still excited though to be filling the nursery soon. Lots of hand sanitizer, and even more organization kept the nursery functional. My Type A and OCD personality was in overdrive. It worked though since these little ones stayed healthy. People often assume that when one cries they will all wake up and cry. However, it is extremely rare for one that is crying or restless to wake the others. They are use to noise since the NICU was a loud place. Eventually, the kids became bigger and needed cribs at about 6 months old. We were blessed with donations of gently used cribs from swap sites, spouses, etc. See the white crib…it was Conner’s! He only had used it once though since he ended up co-sleeping. The quints started sleeping through the night at this point too! We loved the tips we got from http://www.yoursleepingbaby.com/ . Them sleeping through the night was a true blessing. By 5 months in, I was tired! I only average 30 mins of sleep a day and was still breastfeeding them. Michael worked a lot and helped when he was home. Otherwise, we were usually solo with things at that point. My Mom tried to help when she could; however, it was hard since she was my Grandpa’s caregiver. We totally understood and are still amazed we did it and survived without volunteers, hired help, and a copious amount of friends/family around. The quints and I got in a routine with appointments, household chores, pumping, and getting Conner to and from school. Life was hard but manageable. We kept expanding the gated play area the more mobile the kids became. Just before the quints 1st birthday we moved again in AZ. This time we moved to a 4 bedroom, 1400 sq foot base house. Just after the move, we found out about surprise blessing Gideon! He lived in our room after his birth. Here is the quint’s room! The house was a tight squeeze for 9 people but worked. It was nice to be able to walk with the kids to all the playgrounds, grocery store, and some of their doctor’s appointments. It was also nice to not be so isolated and start making some military spouse friends. A couple of the quints started climbing out of their cribs at about 22 months old. We knew it was time to switch to toddler beds. At that same time Michael and I were getting rid of literally all of our furniture and everything since it was time to move for our 3rd time in 2 years. We had to fit 9 people’s stuff into 1 moving truck that he drove from AZ to GA. The only furniture we brought was Conner and my mattresses. Bye bye dining room table, dressers, cribs, couches, grills, toys, appliances, desks, beds, patio furniture, clothes, anything outgrown, pretty much everything. With moving ourselves, we did not have to pay again for going over our weight allowance since that was expensive. I drove the 7 kids by myself from AZ to GA. We made lots of memories and I found a whole lot of strength with us as individuals and as a couple. We ordered new mattresses and toddler beds to GA before we left AZ. That way, they would be waiting for us. We had bought the house a few months earlier while in AZ sight-unseen in GA. We knew it was a fixer upper so I was hoping for the best. It is about 2600 sq feet. It is plenty big for 9 people. Although, we are going to be finishing the basement soon for a larger playroom, sensory/therapy area, and storm safe area. The quintuplets switched to toddler beds at 22 months. We bolted the beds to the floor, and strapped the mattresses to the bed. The kids were caught one day working together to move the beds. We quickly made the room super safe for anything mischievous quints could think about trying. We love the new mattress from http://moonlightslumber.com/mattresses/little-dreamer.cfm . Their original baby crib mattresses fell apart. Hence, we tried these after researching. They have held up amazing and are quint approved! The reason the one toddler bed is light brown instead of matching the 4 girl’s is because it was Conner’s :). It also matches Gideon’s crib. After brushing teeth, reading a bedtime book, a few extra trips to the potty, a few blanket fixes, a few rounds of hugs, and even more kisses, I sit on the floor until they are all sleeping. At first, this would take hours for them to settle down and sleep. Now, within 30 mins, the quints are all asleep. Consistency, organization, and routine are key with everything with multiples. If you do not sit in there, they think it is a giant sleepover party and run around. After all, they are each others best friends. If they get out of their bed, I quietly pick them up and place hem back in bed. They currently nap about 1-1.5 hours during the day and sleep from 6 pm-6/7 am. Occasionally they get up at 330 if they hear Daddy’s alarm clock but I try to get them back to sleep until their normal time to not wreck havoc on their typical schedule. Delilah does not nap every day. Although she is the most active, she has always required the least amount of sleep. She is still required to lay down the same as everybody else at nap time. If she is still awake after 15 minutes of the other 4 sleeping, I put my finger to my lips and she knows to sneak quietly out of the room with me. We both love the one-on-one time. Gideon and Elias will eventually share a room in a couple of years. There are no toys (other than stuffed animals to cuddle), in their room since the room is just for sleeping. We put black out tint on the window to minimize the sun light coming in during nap time since we do not put curtains/blinds in there for safety reasons. Since potty training, the quints do not get water after bed time and are not allowed usually to take milk up to their room. I think this answered a lot of the questions about moves, nurseries, how the quints sleep, naps, and beds. Please feel free to reach out anytime with questions! I try to do a Q and A at least weekly on the blog. Next PostNext 6 Toddlers + 1 Mom go Grocery Shopping and to Project Toy Drop!